It seems it's been a long time. But I am back on track with another challenge. 8th. Before I start a couple of thoughts... I noticed that I do some of the pattern manipulations over and over again and that I should be able to reuse more. So I will be thinking about that more and working toward creating a set of patterns that would need less modifications (for the final design) than starting from the basic bodice as I have been doing. This challenge will be an attempt to reuse some of the previous patterns. 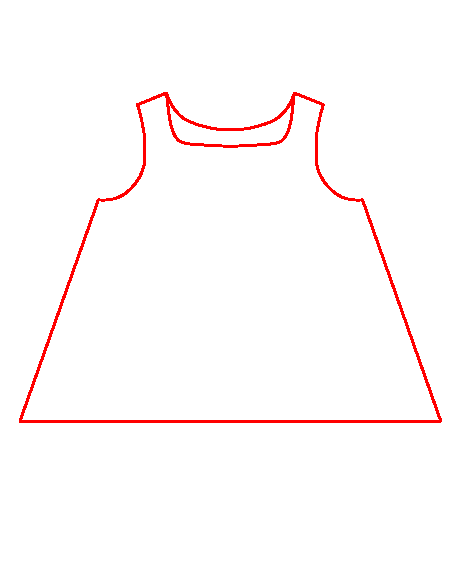 The body of the dress is similar to the week 4 challenge (the basic sleeveless top) with slightly wider arm openings and different neck opening. The sleeves will be a longer version of the first (tighter) sleeve I drafter for the previous project. Let's see how that goes. As I sketched this I was thinking about reusing the sleeve from the previous challenge (the first version, the tighter sleeve). Why not? That type of sleeve would fit this design, all I had to do is make sure I make the sleeve opening the same. And why shouldn't that work? I widened the arm opening in the back by moving part of the shoulder dart and then I matched it in the front. It should work here - it is basically the same set in sleeve. Also, I took in 1 cm at the side seam of both back and front. I can definitely do that here. If the other designs fit overhead, this one should also. OK. I added 20 cm from the waistline. Then, I took the side seam in 1 cm, and then added the high waist shaping 1 cm in at 10.5 cm down the side seam. You can see the shaping above. What you cannot see is that the seam ends at the old, original side seam at the hemline, so that the width at the hemline is the original width. The back pattern is done and can be cut out. The front was a little more complicated - I could not simply copy the front from the Week 4 challenge, even though they will really be similar. So I copied the front bodice on paper, added 20 cm length from waistline and shaped the side seam the same way as the back. 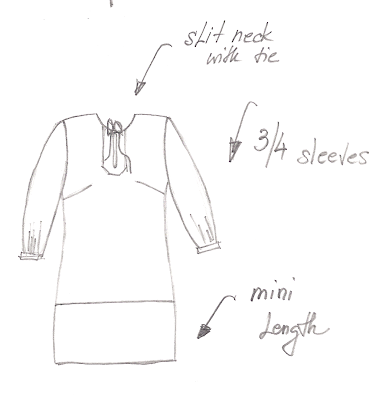 I drew in the new neckline (similar to the Faros tunic neckline). I will not worry about the slit neckline just now. I will add that later (I will not actually have it on muslin... I will skip it and hope for the best). Cut the pattern out. Now the arm opening. From Faros tunic, I know that moving half of the shoulder dart into the arm opening, added about 1 cm to the arm opening. To match that in the front I drew points 1, 2 and 3 as above. 1 and 2 are at dart legs, 3 is 1 cm away from 2. This will stay in the arm opening. The rest (between 1 and 3) will be moved at the line from point 4 to bust point (point 4 is 6 cm below arm opening). Now cut the dart between 1, 3 and bust point and cut along the line from 4 to bust point. Close the cut dart until 1 and 3 overlap and tape together. Smooth arm opening around point 3. tape the newly opened dart to paper below. Draw the new dart: draw the line going through the middle of the dart all the way past the side seam. 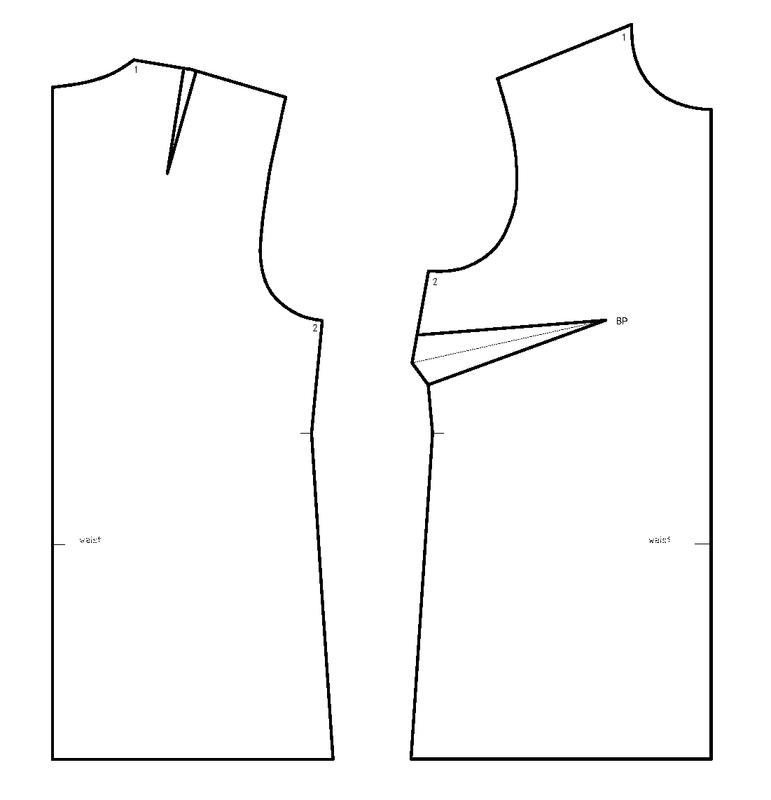 Then continue the side seam above the dart from point 5 until it crosses the line through the dart (point 6). Then connect 6 and 4. Front is finished. And finally the sleeve. That is the most complicated piece to draft (in my opinion) so it's good to reuse. I copied the Faros sleeve along with all the alignment markings. 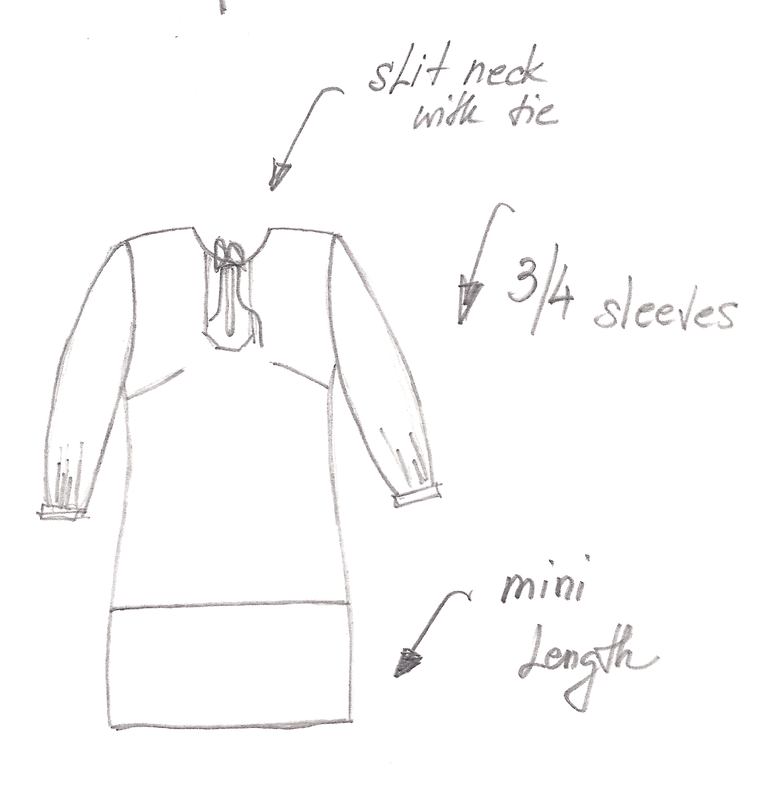 I drew in the sleeve cap line (the line that starts at the top of the sleeve cap and divides the sleeve into front and back parts) and measured 3/4 of sleeve length (from the top of sleeve cap). I extended the sleeve to that length, and cut it out. Since this particular sleeve is not too wide, I did not narrow the sleeve at the sleeve opening, so that the width is the same along the length. I will just use a band at the opening that will be a little narrower, to get the gathers as in the sketch. Finally I overlayed Faros tunic pieces over (actually under) the finished pieces to copy the alignment markings (for the sleeve). For the front and back. (I can do this since the arm openings and the sleeves are the same for both items). I don't need this for muslin, but I drew it just to be done drafting. 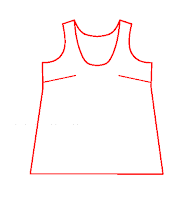 This will be the placket (is that what it's called) in the front at the slit neckline. The line close to the center line (0.5 from the centerline) is actually where the placket will be stitched to the front bodice, it's not a seam. This was quite faster than doing everything from scratch. But I am thinking this could be simplified even more. Hmm... something to think about.